The mission of the Boys Scouts of America is to prepare young people to make ethical and moral choices over their lifetimes by instilling in them the values of the Scout Oath and Law. Some of the best things about Cub Scouting are the activities the boys (and sometimes you!) get to do: camping, hiking, racing model cars, going on field trips, or doing projects that help our community and the people who live here. Cub Scouting means "doing." All of our activities are designed to have the boys doing something--and by "doing", they learn valuable life lessons. Yes! As a program for the entire family, Cub Scouting can teach your boy a wholesome system of core values and beliefs while building and strengthening relationships among family members. Scouting provides a number of mentors to help your son grow, but you are also a central part of his development in scouting. We don't expect a parent to leap right in; your role can be a more passive one. BUT--be warned: Cub Scouting may affect you in the same way it does your son, and you might eventually catch 'the fever' that many of our leaders have gotten from Scouting! Of course, you are encouraged to participate at whatever level you feel comfortable. Cub Scouting is for boys in first through fifth grades, or 6 to 10 years of age. Boys who are older than 10, or who have completed the fifth grade, can no longer join Cub Scouts, but they are eligible to join a Boy Scout Troop. Activities are used to achieve the aims of Scouting—citizenship training, character development, and personal fitness. Most of the activities happen in the den (with the children in their grade) or with the entire pack (with all the grade levels). Pack and den activities often include field trips and plenty of outdoor and indoor activities to help them achieve goals. 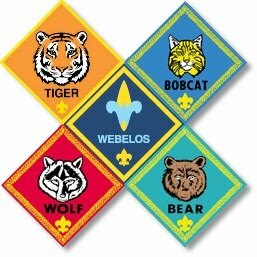 At minimum, each boy in Cub Scouting will need Class A (blue shirt and neckerchief) and Class B (pack t-shirt) uniforms, as well as a handbook appropriate for his rank level. Each year, the handbook changes, as does the uniform cap and neckerchief, but other uniform components remain the same for at least the first three years. When a boy enters a Webelos den, he may elect to wear the khaki uniform worn by Boy Scouts. Visit the "Uniforms" menu in the left-hand navigation bar for details on which uniform components are needed for each rank level. 2 Do the Parents Have a Role? 3 How Old (or Young) Can a Boy be to Join? 4 How do our Scouts Achieve Their Goals? 5 What Supplies and Equipment are Needed?